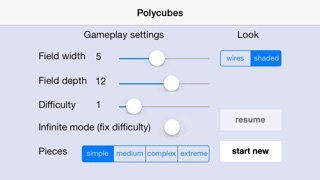 Create full layers from the falling polycube shapes to make them disappear! 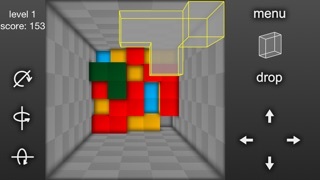 The gameplay is similar to that of the well-known Tetris® , only this time it's in 3D: rotate and move the falling pieces before they reach the bottom of the pit in a way that they create layers without gaps. 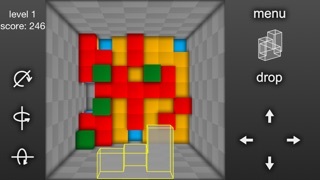 Depending on the settings you choose the game can be a fast-paced reflex game or a slow brain teaser puzzle. 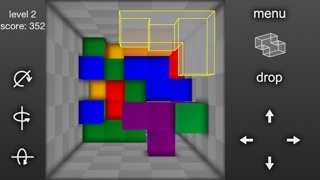 If you've ever played Blockout, the shapes and settings are basically the same. Simple UI and fine amount of control. The only drawback is that the rotation is only one direction per axis- so if you over-turn, you'll have to rotate it three more times instead of moving the other direction, fine when slow but can break a placement later. Overall a fun little game. I recommend it. I payed goo money for this game. There should not be pop up ads, bad form. Also, the touch screen gameplay has been altered where the game pieces can not be moved by simply touching them anymore. If it weren't for these two issues, I would be playing and enjoying this game much more often. Update / down from 4 to 2 stars. As you get to higher scores the interface becomes VERY frustrating and unreliable. Doesn't always register taps, so it's hard to move fast enough, buttons too close together so it's easy to incorrectly place a form. After working to a high score this is VERY irritating. _______ Really nice to see this available on the iphone / ipad. One of the classic games really worth playing for the mental workout (and fun). Really beneficial for development of "mental rotation" skills. (Folks need to understand that in order to play well and get the benefits you need to learn the blocks AND how the controls work... and the quickest way to get the orientation you want with fewest keys. There's a learning curve, but it's worth it.) Good job, VERY welcome. REQUESTS: - Ability to customize block sets, or at least have the standard blockout sets, full 5, 6 piece (all variations sets), etc. (Very hard to play with some, yeah... but thisbhas never been a game that you "win," the goal is to hold off "losing" as long as possible. It's challenging by nature.) - Something that would be cool, that I've never seen would be a mode in which a piece is shown in some one orientation as a "target," with a the same piece, shown in a different orientation to be manipulated into the "target" orientation in as few key presses as possible. Sort of a "training mode." That would rock itbright over the top. - The above in an iPad HD version would be great. fantastic!!! owesome!!! You must try it! And I want app for ipad too. I played this game many moons ago on my 386 (maybe even my 286) I still have the 5 1/4 floppy disk that has it on it. I am so happy you did that and love playing it. 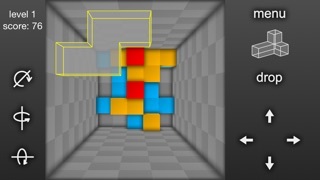 To anyone that thinks its just another Tetris game, give it a try, you won't be sorry. I have been waiting for this app for a while. Great controls, fantastic execution!